Zulu or isiZulu (Zulu: isiZulu) is the language of the Zulu people. 10 million people speak Zulu, and most of them (95%) live in South Africa. It is the most common home language in South Africa, where 24% of people speak it at home. Over 50% of the population also speak and understand the language. In 1994, it became one of South Africa's 11 official languages. Like other Bantu languages, Zulu is written using the Latin alphabet. Where isiZulu is spoke in South Africa: proportion (percentage) of the population that speaks isiZulu at home. 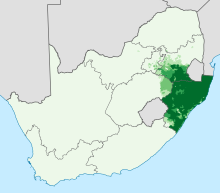 Where isiZulu is spoken in South Africa: density of isiZulu home-language speakers. Zulu belongs to the Nguni group of Bantu languages. Zulu migrants (people who move from place to place) have taken the language to other regions. There are now Zulu speakers in Zimbabwe, Lesotho, Mozambique, Malawi, and Swaziland. Zulu speakers in Zimbabwe speak a dialect called "Northern Ndebele language." People who speak Xhosa can understand most Zulu. The opposite is also true: Zulu speakers can understand Xhosa. Xhosa language is the most common language spoken in the Eastern Cape of South Africa. The Zulu, Xhosa, and other Nguni people have lived in South Africa for a long time. The Zulu language has a lot of click sounds common in Southern African languages. These click sounds are not found in the rest of Africa. The Nguni people have lived together with other Southern tribes like the San and Khoi. Zulu and all other native Southern African languages was at first an oral language. It was not written down until missionaries came from Europe. These missionaries used the Latin alphabet to write the Zulu language. The first Zulu grammar book was published in Norway in 1850 by Hans Paludan Smith Schreuder. The oldest document written in Zulu is a Bible from 1883. John Dube, a Zulu from Natal, wrote the first Zulu novel, Insila kaShaka, in 1933. Another important Zulu author was Reginald Dhlomo. Dhlomo wrote U-Dingane (1936), U-Shaka (1937), U-Mpande (1938), U-Cetshwayo (1952) and U-Dinizulu (1968). Other important Zulu writers are Benedict Wallet Vilakazi and Oswald Mbuyiseni Mtshali. Before 1994, the Zulu language was controlled by the Zulu Language Board in KwaZulu-Natal. Today, the Pan South African Language Board supports the use of all 11 official languages of South Africa. Before 1994, the official languages of South Africa were English, Dutch, and Afrikaans. During Apartheid, Zulu was spoken commonly in the Kwazulu bantustan. All education, however, at the high school level was in English or Afrikaans. After Apartheid ended in 1994, Zulu became one of the official languages in South Africa. The SABC first started showing Zulu-language television and news programs in the 1980s. There are many Zulu radio stations and newspapers available, mostly in the Kwazulu-Natal province and Johannesburg. The first full-length feature film in Zulu was Yesterday. It was made in 2004 and nominated for an Academy Award (Oscar). Other Lion King songs also had Zulu phrases in them. There are two main types of Zulu. One type is called standard Zulu, and it is taught in schools. Standard Zulu is also called "deep Zulu" (Zulu: isiZulu esijulile). Standard Zulu is a purist language. This means that new ideas are described using words that are derived from other Zulu words. The other type of Zulu is called urban Zulu (Zulu: isiZulu sasedolobheni). Urban Zulu is the kind of Zulu spoken by people who live in cities. Urban Zulu uses loan words borrowed from other languages to describe new ideas. Most of these loan words come from English. These two different types of Zulu language make problems in learning and education. Young people speak urban Zulu and do not often understand standard Zulu. This is a list of phrases in Zulu. Unjani? / Ninjani? How are you (one person)? / How are you (many people)? Hhayibo No! / Stop! / No way! Zulu place names occur in the locative form most of the time. A place name is both a preposition and a name. Changing the prefix of the place name changes the preposition. For example, the Zulu name for Johannesburg is iGoli. The word eGoli means to/at/in/from Johannesburg. The root word Goli means "Johannesburg," but doesn't mean anything by itself in Zulu. Most of the time, changing the i- or u- prefix to the e- prefix changes the meaning like this. In some cases, like with Durban, the name changes too. The Zulu name for the language is isiZulu. The isi- prefix means "language." (It also means other things, but here it means language.) For example, isiNgisi means English, isiXhosa means Xhosa, isiBhunu means Afrikaans, and isiJalimane means German. ↑ 5.0 5.1 Lewis, M. Paul (ed. ), 2009. Ethnologue: Languages of the World, Sixteenth edition. Dallas, Tex. : SIL International. Online version: http://www.ethnologue.com/. Accessed 2011-05-15. ↑ Ager, Simon (2011). "Zulu (isiZulu)". Omniglot. Retrieved 2011-07-03. ↑ 8.0 8.1 8.2 "Zulu literature". Encyclopedia Britannica. Retrieved 2011-07-03. ↑ "R. R. R. Dhlomo". Encyclopædia Britannica (Online ed.). Encyclopædia Britannica. 2011. Retrieved 2011-07-03. This page was last changed on 17 August 2018, at 17:40.